Mobile apps have been made to make our lives rather easier and more well mobile. Previously, I won the "Download & Win" free Globe load from the SM Supermalls app. It was from a digital scratch it feature of the app, which was rather fun to do minus the gray flakes one may get with the usual physical card. Amidst this, it's quite exciting awaiting for your prize as you scratch your phone screen. This time, SM Supermalls and Krispy Kreme is giving away 3 Original Glazed Krispy Kreme doughnuts to 100 unique SM Supermalls mobile app registered users every day from April 30 to June 30, 2016! How sweet is this deal? 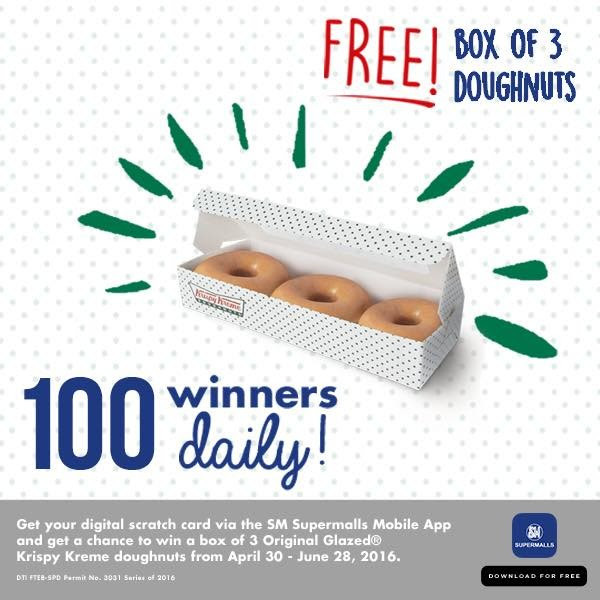 Using the first digital scratch card promotion in the country, you have a chance to win daily exciting prizes like free mobile data, free Spotify, Facebook, Games, Unli-Call and Unli-Text every day for the entire month! Want to start winning? Simple as 1, 2 and 3. Download the app and you will receive a digital scratch card. Just scratch off the gray area to find what you won! The SM Supermall Mobile App is free on Google Play Store link here and Apple App Store link here. The app boasts in a lot of things: other than winning these prizes you can use the Feed section to highlight latest store promotions and offering as well as discounts like free movies, upcoming events and movies on queue. I get lost all the time in SM, a Mall Map has been established to help people like me with direction issues. what a sham. didn't freakin' win anything.